When to Increase Your Weights - Here's How To Know. Do either of these scenarios sound like you? You’ve been on a weight training plan for a while now and the results seem to have leveled off. Your weight lifting routine has become a bit easy and you’re not feeling “wiped-out” after a session like you did when you first started. And now you’re wondering if you should increase your weights. Congratulations … you’ve hit a strength plateau which means you’re now ready to lift more weights! The thought of lifting heavier weights may make you feel a bit hesitant because of the dreaded, “I’m going to bulk-up” misconception. Increasing weights is a natural progression in your workout routine that must be addressed in order to get the results you want. While some people may be content to lift the same amount of weight for months, or even years on end, they are doing their body a disservice by not challenging their muscles to continually work harder and become stronger. Increasing resistance is based on the good old overload principle of strength training that states in order to build strength, the muscles must work harder than they are accustomed to. This “overload” will then result in improved strength as the body adapts to the stress placed upon it. Each individual person has a certain level of strength that they begin at. To become stronger they must regularly increase the weight or resistance that their muscles work against, which then causes them to adapt to this new level. Muscles will then respond to this overload by becoming stronger and eventually lead to better workout results such as increased lean body mass, decreased fat and enhanced self-confidence. Now that we’ve determined that lifting heavier weights is a good thing, let’s map out a plan as to how to actually do it! For many, simply determining what weight they should use for a resistance exercise can be a daunting task. I suggest starting with a light weight (maybe 50% less than what you think you would use for that particular exercise) to get a feel for the exercise and performing it with proper form. 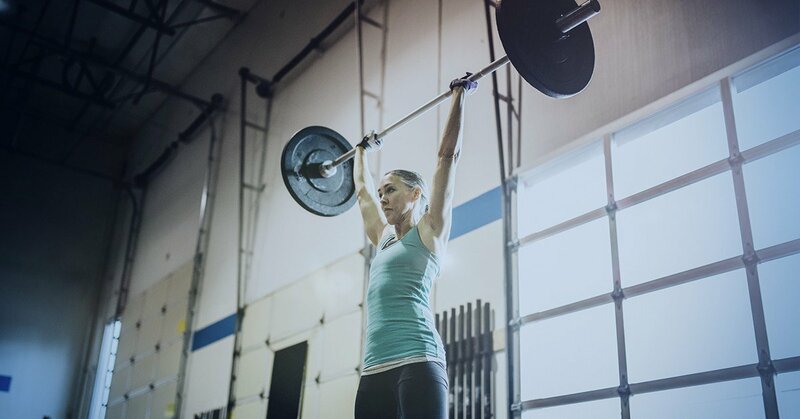 From there, gradually work your way up to performing a few reps at a time until you find a weight that challenges you to slow down in order to complete your reps with good form. Note that weight and that is a good starting point for what you should use on that exercise. How Often Should You Increase Your Weights? As your body acclimates to a prescribed rep and set scheme (example: 3 sets of 8-10 reps), you’ll gain a better understanding of knowing when a weight has become too easy. I like to use the last few reps on a set as a good indicator. Say you’re doing a set of 10 dumbbell shoulder presses and reps 8, 9 and 10 were fairly easy and you performed the set with little to no struggle at the end. Could you have done another 1, 2 or 3 more reps? If so, that’s a good sign that it’s time to bump it up! On the flip side, if you struggled and could barely finish your last couple of reps with good form, than you are NOT ready to increase your weights on that particular exercise. Keep at it until those final reps start to feel easier. Another good indicator is the speed of the exercise and how you feel after you complete your prescribed sets. If your last few reps are slow and strenuous and you feel out of breath, then you’re probably using the right level of resistance. If you find yourself flying through the set with the last few reps just as easy as the all the others, than you know it’s time to go heavier. How Much Weight Should You Add? Now that you’ve determined you need to increase your resistance on an exercise, how do you know how much weight to add? The key here is to increase slowly. If you’re using free weights such as dumbbells, the progression is fairly simple … just jump to the next weight up (usually a 5 lb. increase in most dumbbell sets). Many machines will have 2.5 weight increments, so just move up slowly and use your last few reps as a gauge to determine if you’ve found your new weight. As a rule, many fitness professionals will say not to increase your weight by more than 10% at a time. So if you are currently lifting 100 pounds on a barbell squat, add no more than 10 lbs. when it’s time to increase the weight. You’ll see many lifters keep a journal of their workouts. This can be a valuable tool in assessing progress and knowing how far you’ve come in your fitness journey. Simply track your exercises, reps and sets as well as the weight used for each. Fitness logs can help you determine what area you might need to work more on (example: your bench press hasn’t gone up in a long time, so maybe it’s time to add in a new upper body exercise such as push-ups to help you bust through that plateau). You can also jot down brief notes on each workout that can help you know when you’re at your best/worst (“got 8 hours of sleep last night…workout felt great today,” “skipped breakfast this morning, workout was tough today,” “added yoga on non-lifting days…feeling fresh and recovered for strength workouts). Because of the body’s amazing ability to adapt, there comes a time where light weight can be a waste of time. Embrace the challenge and push yourself on the last few reps of each set and see how that can jump-start your results and change your body for the better.